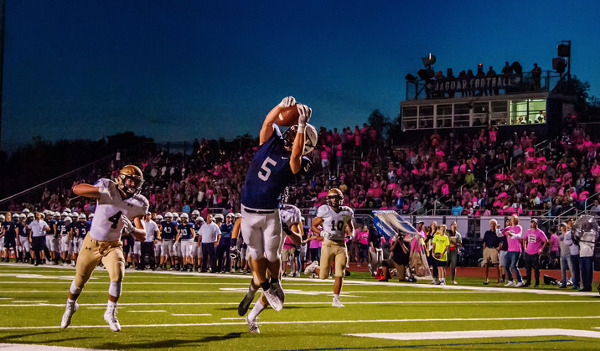 Kpreps.com would like to congratulate Lori Habiger for submitting the winning photograph for Week 5 of the Kpreps Friday Night Photo Contest. Lori’s photo captures Mill Valley receiver Logan Talley hauling in a touchdown pass from quarterback Brody Flaming during the Jaguar’s 42-21 loss to No. 2 St. Thomas Aquinas. Talley caught a team-high eight receptions for 141 yards and this touchdown to push his season total to 595 receiving yards and six scores. For this winning photograph, Lori is now eligible for our 2017 Grand Prize including $500 in cash.